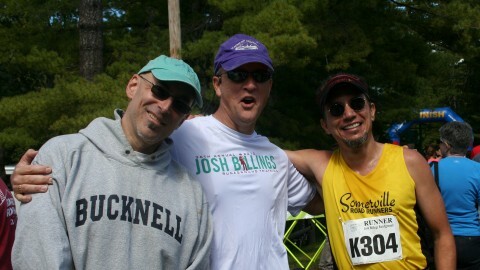 Sunday was the Josh Billings Runaground Triathlon. 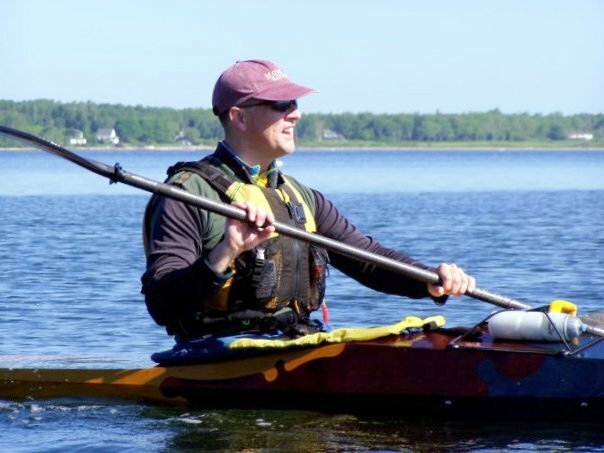 The race consists of three legs, a 27 mile bike leg, a 5 mile paddle on the lake in the Stockbridge Bowl, and a 6 mile run around the bowl ending on the grounds of Tanglewood, the summer home of the Boston Symphony Orchestra. It’s held literally smack in the middle of Norman Rockwell’s America, on tree-shaded roads that wind up and down hills and around lakes in the quaint New England countryside. This was my second year at the Josh. Last year Ruth and I found a nice a bed-and-breakfast just down the road from Tanglewood, the race itself was different and fun, and the Berkshires were beautiful in the early fall weather. We decided we’d go back again, and this year we invited some friends to join us. Mark brought his bike from Vermont with Karen, Dave and Donna brought Dave’s puzzle boat from North Andover, I packed my running shoes in a bag, and we all met in Stockbridge for the race. Ruth and I stayed at the same B&B again this year. Our previous race experience helped us take better advantage of the convenience. Last year I did the paddle leg, which required me to get up at 4:30 in the morning to get a good spot for my boat at the first exchange. This year, our alarm went off two hours later. Instead of rushing out to the exchange in the dark, we strolled downstairs for breakfast at 7AM. I wouldn’t be running until sometime around noon, so I had a full breakfast with pancakes, sausage and bacon to go with my coffee, orange juice, and banana. Then we lounged around in our room until it was time to head out for the race. Mark and Karen stayed in Great Barrington, just across the street from the start of the bike leg. Karen sent us some pictures before the start, including one of Mark dressed in his bike gear so we’d know what to look for at the first exchange. She also sent a text to report the first bike crash of the race, which occurred in the Price Chopper parking lot while waiting for the race to begin. We left our bed-and-breakfast at 9:30, which happened to be the same time as the start of the race. The Berkshires came through with another wonderful, sunny fall day. The temperature was pleasantly cool for racing after a hot summer, yet warm enough to make spectating and the inevitable waiting at exchanges enjoyable. Back in Great Barrington, Karen caught the next crash on video right after the gun. 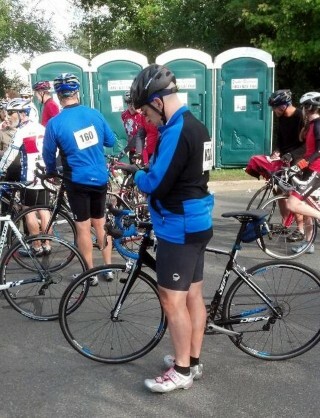 Bike races are scary. While Mark was rolling through the hills of the bike leg, Ruth and I walked by Tanglewood to the first exchange, a parking lot leading to a boat ramp about a mile and a half down the road from our B&B. We spent the walk savoring how leaving my boat at home allowed us to bypass the battle for prime parking spaces. We met Dave and Donna in the lot by Dave’s kayak, which was in the first row next to the water. Karen joined us after driving over from the start and we all went up to the turn leading into the boat launch to watch the excitement and wait for Mark’s arrival. The exchange between the bikes and the paddlers occurs at the entrance to the parking lot. Bicyclists come flying down a half-mile hill from Tanglewood into the exchange area. 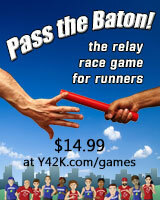 He (or she) is carrying the relay baton, a blue knit wristband. As a rider approaches the exchange point, with any luck their paddler sees them coming and fights his way out of the crowd of other paddlers to jump out in the road so the rider can see him and pass him the wristband. Once the paddler gets the wristband, he runs down to his boat, carries the boat to the water (with the help of race volunteers if necessary), and then jumps in and starts paddling. The fastest bicyclists cruise right through the exchange point, flinging the wristband at their paddler as they go by. On slower teams, or when the exchange gets busy, the biker stops and hands the wristband to the paddler. When a pack of bikes arrive together it’s a hectic scene, with people crowding in, lots of yelling, and wristbands flying through the air. 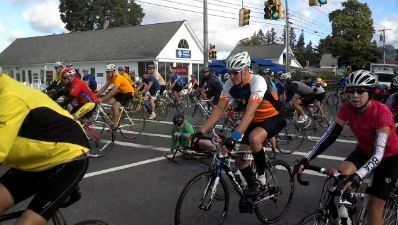 Every once in a while a biker doesn’t manage to detach a cleat from their pedal in time to prop themselves up when they stop, so they fall over and everyone holds their breath until the rider disentangles and pulls himself out of the scrum. Then you throw in the Ironpersons, people doing the entire race by themselves, who have to make a sharp left turn through the exchange zone into the gravel parking lot to get to the area where they leave their bikes before the run to their boats. People are either terrified or excited by the scene at the exchange, but everybody gets an adrenaline rush out of it. Mark arrived in 1:36, a little after the bulk of the riders had come through, so things were a little more sedate. He was able to stop and hand the wristband to Dave, who turned and dashed for the water while Mark pulled his bike off the other side of the road. I said goodbye to Ruth and headed up the hill for a two mile warmup jog around the lake to the second exchange point at Camp Mah-Kee-Nac while Dave was doing the paddle leg. 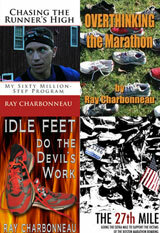 His five mile course circled the lake counter-clockwise about one and three-quarter times around a set of buoys. There are a wide array of boat types and paddler skill levels in the race. By the time Dave started, most of the fast boats were well on their way so Dave was in his wooden kayak, picking his way through crowds of people much less skilled than he is. The second exchange is nowhere near as scary as the first, but it’s still hectic. Runners wait on the beach at the camp for their paddler to arrive. 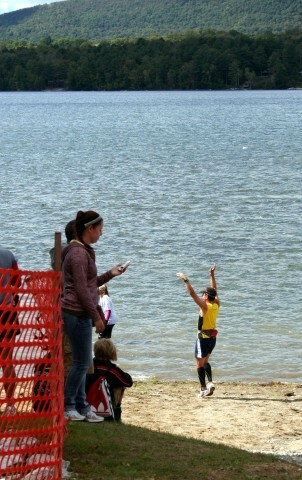 When a paddler gets there, he tries to throw the wristband to the runner waiting on the shore. As I found out last year, it’s surprisingly hard to throw something while sitting in a kayak. Often the wristband doesn’t make it all the way onto dry land, but there’s a crew of volunteers waiting to wade into the water, recover the wristband, and toss it to the runner, while other volunteers shove the boats along to make room for the next paddler. The runner grabs the wristband and dashes uphill, out of the camp and back to the road to circle the lake clockwise on land. By the time I reached the camp, the wind had picked up some, creating some chop on the lake. I had to wait in the crowds on the shore for about a half an hour, but when Dave arrived he was easy to see. All I had to do was look for someone in a kayak with a yellow paddle who looked like they knew what they were doing. It was particularly easy to find Dave because the wind was coming across the bows of the paddlers as they approached the camp and Dave was one of the few that weren’t being blown off course. Dave finished in a little over 57 minutes, moving us up 126 places. After the race, Dave said that passing so many boats made him feel like a rock star. He also succeeded in tossing me the wristband without any help from the volunteers. Now it was my turn. I grabbed the wristband, turned and raced up the hill. Since I didn’t want to miss Dave’s arrival while waiting in line at the port-a-potties, I had to stop before reaching the road to pee in the woods. Once that was done, I took off. The course around the lake was relentlessly hilly, as bad as Lake Winnipesaukee, just not as long. 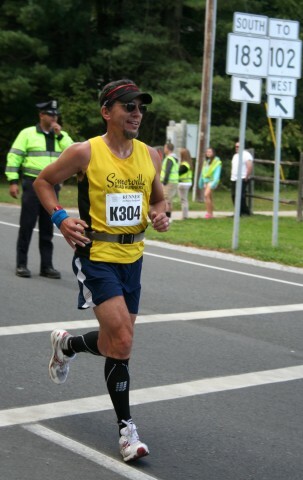 I held back a little for the first 5 miles, running at a little more than marathon-pace effort, partly because I want to save myself for Cape Cod, and partly because I knew that at mile 5 we had to run up the half-mile hill that makes the bikers look so good when they roll down it to finish their leg. It felt good to be running strong and within myself after a week of worrying about my calves because of Lake Winnie. 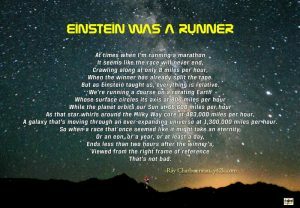 There were plenty of slower runners for me to pass, providing me with the illusion of speed. I had to laugh when I passed an Ironperson who was explaining to a friend how he had gone over in his boat 4 times while trying to navigate the lake. That sort of thing is what makes the Josh fun. It’s also why I don’t do triathalons with a swim leg. I steamed by a few more people going up the last hill and then took advantage of the flat-to-slightly-downhill roll to the finish to pick it up and race in at about a 6:30 pace, which is fast for me these days. My calves had passed the test, and between the Josh and Lake Winnie I more than made up for missing my hill repeats this week. My time of 46:41 gained us another 71 places, so Team Blackburn ended up 170th overall with a time of 3:20:24. We finished 9th in the 50+/single kayak division and beat the time of my team from last year by almost 16 minutes. After the race, Mark and Karen left for the long ride back to Vermont while Ruth and I strolled back to the B&B so I could take a shower. We packed up the car and went to a café in Lenox to sit outside with Dave and Donna and have smoothies and sandwiches in the glorious afternoon sun before we got back the car for the drive home. 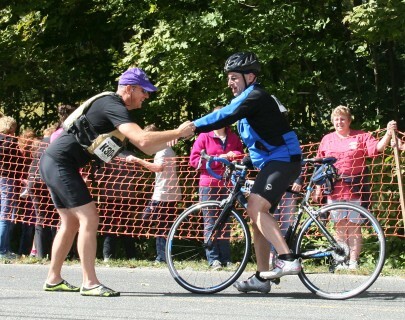 Pingback: My First Tri (and First Bike Race) – the 2014 Josh Billings RunAground | Y42K?